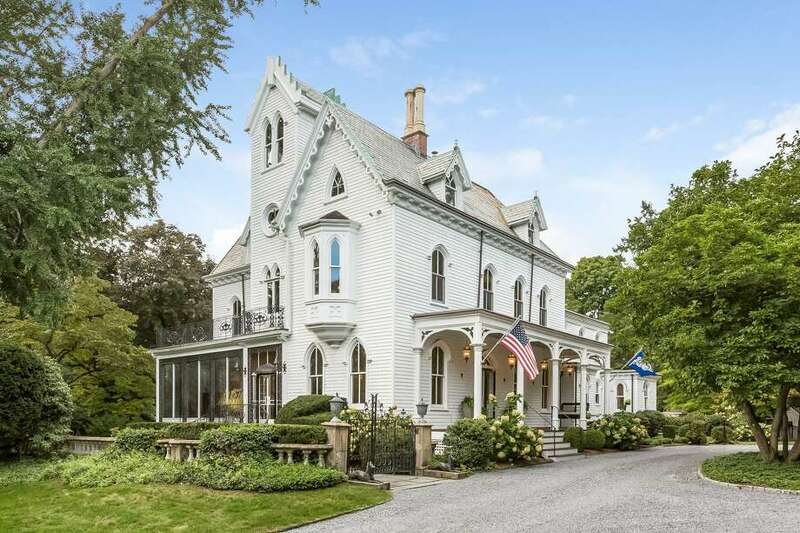 A major restoration project of the antique Gothic Victorian house at 2265 Boston Post Road preserved it period features inside and out while providing it with modern amenities. DARIEN — Gardens figure prominently in religion, literature, art and history, from the Garden of Eden to Frances Hodgson Burnett’s “The Secret Garden,” from artist Claude Monet’s garden at Giverny to the Hanging Gardens of Babylon, the latter one of the Seven Wonders of the Ancient World. Darien has its own landmark garden of sorts, an estate called The Garden Gate, and on this 1.6-acre level property the most beautiful of its flowers is the 6,371-square-foot updated antique Gothic Victorian house at 2265 Boston Post Road in the Noroton neighborhood. The original estate comprised 17 acres and was named The Lindens. Linden trees are still found on the property, as are many other tall, mature trees, shrubbery and perennial flower gardens. It also contains an in-ground swimming pool and pool house. The property has a long and interesting history. The house was built in 1856. The Garden Gate is an appropriate name for the property, since its original owner, Frederick W. Bruggerhof (1830-1920), “was a powerful influence throughout the whole seed industry in America,” according to his obituary, provided by the co-listing agents, one of whom owns the property. FEATURES: water community, walk to water, 1.6-acre level property, heated in-ground swimming pool, pool house, instant hot water tap, covered front porch, covered wrap-around rear porch, slate patio, balconies, eight fireplaces, wet bar, cable available/wired for cable, slate roof, programmable thermostat, Thermopane windows, walking distance to Hindley Elementary School and Darien YMCA, proximity to shops and restaurants on Post Road (Route 1), close to Weed Beach, easy access to public transportation, Noroton Heights Metro- North train station, rear stairs, walk-in cedar closet, professional landscaping, detached three-car garage, zoned air conditioning and oil heat, 50-gallon water heater tank, full partially finished basement, walk-up attic, circular crushed stone driveway, six bedrooms, four full and one half baths. The obituary said Bruggerhof was known as the “grand old man of the seed world” and earned an international reputation for collecting and distributing American tree seeds throughout the world. Real estate agent Stacy Book and her husband, Jim Book, purchased the house in 2002. They worked closely with Westport architect Mella Kernan and Stamford contractor SWS Builders to restore it to its former glory. The home has been completely redone, from the basement to the top of the turret, imbued with modern amenities, such as CAT wiring, radiant heat, all new custom windows and roof, while preserving its period details and ornamentation. The project earned for SWS Builders the 2008 HOBI Award for Best Antique Home Renovation from the Home Builders & Remodelers Association of Connecticut. The house features 12-foot ceilings, eight Italian marble fireplaces, original hardware and decorative iron work gates inside and out. Glass from the home’s original windows was repurposed in some cabinet doors. There is tiger maple flooring in the hallway of the main living level. The family room features its original plaster ceiling medallion. Custom windows and doors bring the outside in. The grand porches, including the wide wrap-around back porch, provide comfortable places to relax and enjoy views of the striking grounds, and extend the entertainment areas to the outdoors. Many rooms, including the cavernous gourmet kitchen, have doors to the porches and grounds. In the kitchen, the cabinets are a mix of antiques and new construction, although the new ones were deliberately distressed to give the impression of age. The same is true of the flooring. The kitchen features a center island topped with a thick marble counter, a large double farm sink, Wolf six-burner range with a decorative tin backsplash, walk-in pantry and a service bar with floating cabinetry and butcher block counter. The Viking side-by-side refrigerator-freezer is hidden inside a large mirrored armoire. The renovation of the banquet-size formal dining room has yet to be finished. Its walls are stripped, yet the beauty of the room in the past, and yet to come, is easy to envision. There are six bedrooms, including an impressive master suite with two fireplaces, one in the bedroom. Its private bath, which is quite large, also features a fireplace and has a claw-foot soaking tub. This grand residence is conveniently located close to local beaches, schools, shops and public transportation. and Montanaro at 203-655-1423 or jen.montanaro@raveis.com.